The Western medical system is finally beginning to face the fact that marijuana is not a drug: it’s a medicine. More than 5000 years of use throughout many different cultures and hundreds of studies have proven the safety and efficacy of cannabis use, so what more we waiting for? endocannabinoid system. This system is made up of neuromodulatory lipids and cannabinoid receptors located in the brain (particularly in the cerebellum, cerebral cortex, hippocampus, basal ganglia and spinal cord) and throughout the central and peripheral nervous system. These receptors are also found in various organs, connective tissues, glands, and immune cells (1). Because the endocannabinoid system is connected to so many different systems and the brain, it’s often described as a bridge between body and mind. CB1 are predominantly present in the nervous system, connective tissues, gonads, glands, and organs. They mediate physiological effects on the central nervous system and have been reported to modulate immune responses. CB2 are predominantly found in the immune system and its associated structures. They’re known to inhibit inflammation and edema, diminish pain, and protect the liver against injury. Additionally, researchers believe that these receptors may hold the key to treating atherosclerosis and osteoporosis. Most tissues in the body contain both CB1 and CB2 receptors, which work together to perform different actions. Researchers believe that a third cannabinoid receptor exists, but it’s yet to be discovered. These receptors are also believed to be more numerous than any other receptor system. Your body even produces its own cannabinoids within endothelial cells, adipocytes, glial cells, macrophage, and Purkinje cells (3). They’re produced by neurons “on demand” to alter the way that information is received and filtered in the goal of creating a calming effect (4). On a psychological level, the substances promote a more social and positive mood, promoting sharing, humor, and creativity. They also affect learning and plasticity to make a person more open-minded and more likely to move beyond regular thinking patterns. 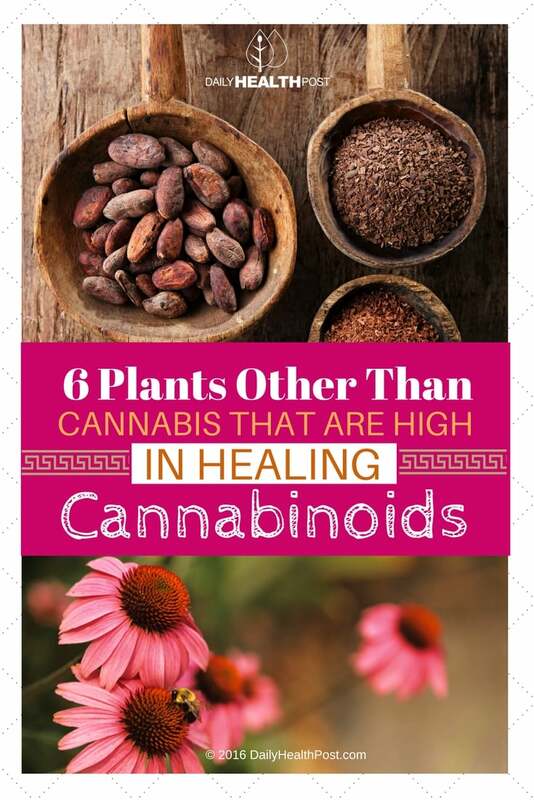 Cannabis is the most well-known and well-studied source of phytocannabinoids (plant-sourced cannabinoids), containing 65 cannabinoid-like substances. Of the 65, only Δ9-tetrahydrocannabinol (THC), Δ8-tetrahydrocannabinol, and cannabinol are known to activate both CB1 and CB2 (5,6). However, other plants produce cannabinoids and cannabinoid-like substances that may have similar beneficial properties as marijuana. 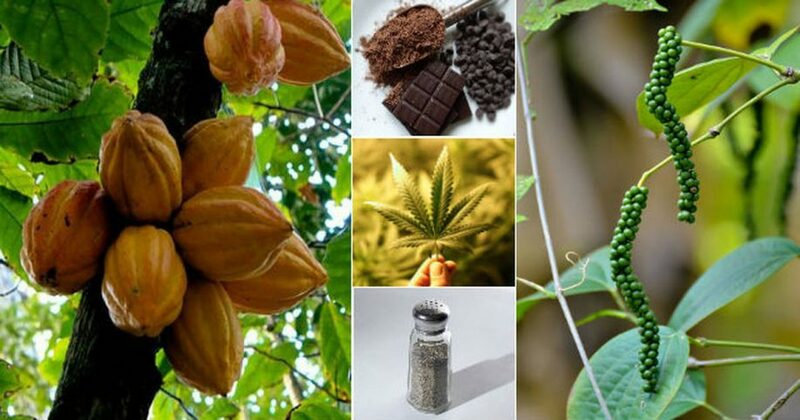 Much remains to be known about endocannabinoid- triggering compounds and the endocannabinoid system in general, but here are 6 plants that have expanded our these substances and structures. Here are a few more legals ways to stimulate you endocannabinoid system! Echinacea is mainly used to combat the common cold, although it’s also beneficial in the treatment of indigestion, ADHD, chronic fatigue syndrome, migraines, chronic pain, and urinary tract infections (6). The plant even made it into the US National Formulary from 1916-1950, until it feel into obscurity in favor of antibiotics (7). Echinacea doesn’t contain he same kind of cananbinoids as cannabis, but it does contain N-alkylamides (alkamides), which bind to CB2 receptors to regulate the immune system, minimize pain, and reduce inflammation (8). In its native Amazon, the electric daisy is used to treat toothaches, ulcers, irritable bowel syndrome, abscesses, and to clean the teeth (9). Its most prized distinction, though, is its remarkable painkilling properties as it blocking nerve endings to provide numbness for over an hour without any side-effects (10). The cannabinoid-like compound responsible for this is called N-Isobutylamides. Like Echinacea, electric daisy binds to CB2 receptors. This South African daisy has both mood-stabilizing and antidepressant effects thanks to its cannabigerol content. During a 2014 International Cannabinoid Research Society meeting, Italian natural product chemist Giovanni Appendino explained that this substance is the precursor to the active cannabinoids in cannabis, THC, CBD, and CBC (cannabichromene). As with cannabis, the plant is burned during sacred ceremonies and the fumes create a psychotropic effect (11,12). As well as cannabigerol, this New Zealand native contains a newly discovered cannabinoid-type bibenzyl compound named perrottetinenic acid. Unlike most cannabinoid-type compounds, perrottetinenic acid binds to CB1 receptors (13). Liverwort also contains two previously unknown bibenzyls, as well as a known cannabinoid, perrottetinene. This wealth of compounds may explain its ability to treat bronchitis and heal gallbladder, liver, and bladder problems. It’s no secret that chocolate improves mood, but scientists are just beginning to discover how this food really works. It contains N-linoleoylethanolamide and N-oleoylethanolamide, which prevents the breakdown of down the endocannabinoid anandamide by deactivating the FAAH enzyme. Anandamide is released by neurons and binds to cannabinoid receptors with high affinity and mimics the effects of cannabinoid drugs. This heightens your senses and improves well-being, which may explain why we experience chocolate cravings (14). Black pepper has a lot more to offer than just a flavor boost. It contains β-caryophyllene, a cannabinoid that binds to CB2 receptors to reduce inflammation. It’s also a common aroma molecule that’s found in many essential oils (15). β-caryophyllene is easy to digest and can be beneficial in the treatment of arthritis and osteoporosis.